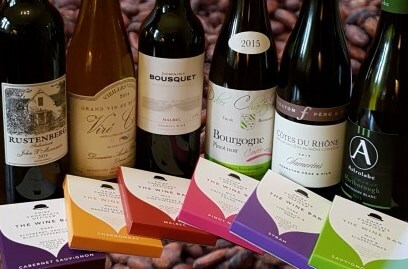 I was contacted last month about a newly-launched range of chocolate bars from the Chief Chocolate Officer, a company based in London that has designed the bars with ingredients that mimick the most popular aroma and flavour descriptors of various varietal wines. Thus there is a Sauvignon Blanc chocolate infused with elderflower and pear, and a Syrah chocolate flavoured with liquorice and rose for example. The chocolates are designed to be enjoyed with a glass of the matching wine, but I found each to be an extremely high quality chocolate that’s delicious on its own too: the chocolate has excellent snap, and the flavourings are vivid and work really well together, the finish of each lingering and precise. Large 100g bars sell for £3.99 each, with 50g mini-bars at £2.75. They are available from chiefchocolateofficer.com, but are also in a number of retailers including Lakeland and the Jeroboams wine merchant chain. It was not a hardship to sample the chocolates, but even better, specialist wine merchant halfwine.com is selling a gift pack of six half bottles along with the six flavours of chocolate bar, and I was lucky enough to be sent this tasting ‘kit’, so that I could evaluate the chocolates along with a selected wine. Half bottles of wine have been in the news recently as Waitrose launched a small own-label range to much fanfare, but halfwine has managed to pull together no fewer than 70 quality wines in half bottle, including wines from some very well-known producers. Names that caught my eye included Esporão, CVNE, Astrolabe, Jadot, Rustenberg, Fontodi and Torbreck to name but a few. There is a slight premium to be paid for the half bottle convenience, but I suspect this is a fairly large niche market that many will be delighted to discover. The wine and chocolate gift box tasted here costs £79, for the six half bottles and six matching 50g bars, including UK delivery. As you will see, I was suitably impressed by the 12 items individually, and the six matched pairs. Apparently the Chardonnay will be replaced by a slightly more oak influenced wine at some point. (2017) This 2015 Marlborough Sauvignon is flamboyant aromatically, the ginger spice and elderflower joined by distinctly tropical fruit, not too herbaceous, but inviting. In the mouth that juicy peach and passion fruit tropical fruit core drives forward, the acid is keen but really nicely balanced, and a certain sense of fullness and richness gives broader appeal than some examples. The match here is a milk chocolate flavoured with elderflower and pear, the chocolate itself more subtly flavoured than some in the range, but its creaminess becoming truly opulent when nibbled with the wine, acid not too harsh against the flavour, and another lovely match. Price for a half bottle. (2017) This is a fine and elegant white Burgundy from Vire Clessé in the Mâconnais, and vines that are 80 years old on average. The oak is fragrant and almondy, the orchard fruit juicy and ripe, leading on to a palate very nicely balanced by a core of ripe, lime and tangerine acidity, the creamy and spicy infill of the barrel, and that succulent fruit. The Chief Chocolate Officer suggests a lovely, creamy white chocolate flavoured with orange blossom and toffee with this, and it is a very nice match: the wine is perhaps a touch too dry for 100% success, but both chocolate and wine are really very good. (2017) Charton-Vachet is a new Burgundy name to me, based in Nuits-St-Georges and farming organically and using natural yeasts and minimal sulphur. This Bourgogne has a lovey tart/dry cherry nose, a briary background but really about the fruit that seems pert and clean, and most attractive. In the mouth it delivers cool, elegant Pinosity, the fruit alert and charming, orange and tart cherry, the tannins dry and fine and the whole picture balanced, elegant and delicious. The milk chocolate designed to match is flavoured with coffee, cherry and nibs of cacao. Though the acidity of this wine was a touch prominent in the opening seconds when tasting both together, the sweetness of the Pinot fruit against the coffee was then lovely, and the crunch of the nibs release more little counterbalancing bittersweet notes. (2017) A blend of 85% Grenache with Syrah and Cinsault, this is an unoaked and very powerful expression of peppery, spicy Rhône, lightly meaty with plummy dark fruit. On the palate it is all about savouriness, a bit of sizzling roasted meat, liquorice and quite a lean acid framework, but the plummy, dry fruit does come through as does the spice of the grape and tannins. A food wine that is a tad rustic but good, but matched to the Chief Chocolate Officer's bitter dark chocolate infused with liquorice and rose, really rather sensational as a marriage in the mouth. (2017) A certified organic Malbec from vineyards at 1200 metres altitude in Mendoza, this is a lovely expression of Malbec's floral, Parma violet-scented personality, kirsch like black cherry fruit and a touchy of meaty reduction. On the palate it is really juicy and vivid, that black fruit core ripe and sweet, but with a liveliness to the cherry skin acidity and tug of tannins. With a moderate 13% alcohol it also feels unforced and balanced. The Chocolate Officer's match here is with a milk chocolate flavoured with fig, smoke and pink peppercorn. It's one of the more subtley flavoured chocolates in the range until, that is, you crunch into a peppercorn. Then the wine and chocolate combination really sings, quite luxurious and balancing sweet fruit and peppery spice. Wine price is for a half bottle.